Aiguille de Chardonnet North face. It was quickly becoming my nemesis. 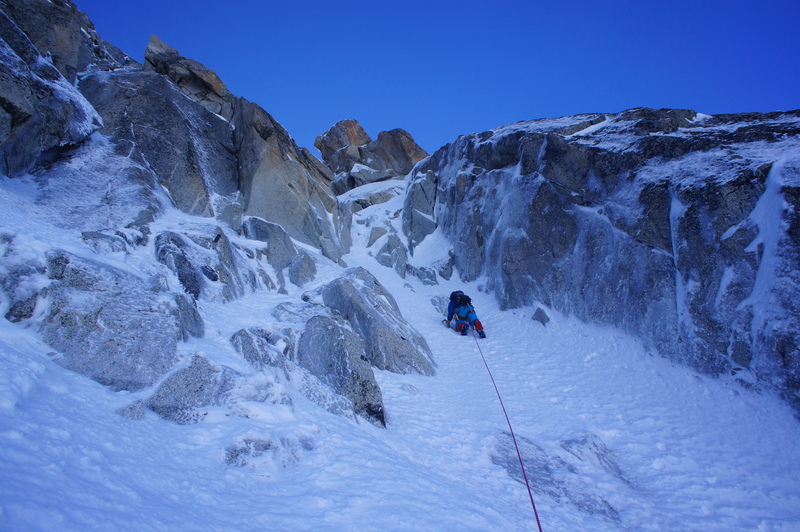 In winter I was shut down on two aspects during a solo link up attempt of the Chardonnet and Aiguille d’Argentiere. More recently I was served a piece o’Gandolf pie with a big blunt ‘You shall not pass’ taking the central route across the glacier. 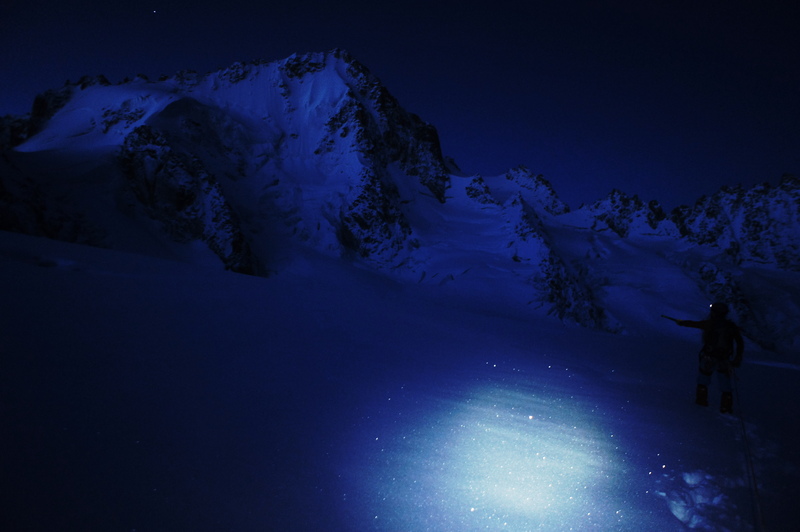 We had arrived by moonlight the night before and hadn’t been able to scope out the route. I foolishly thought I could take the same line as I did for the Migot Spur last summer. 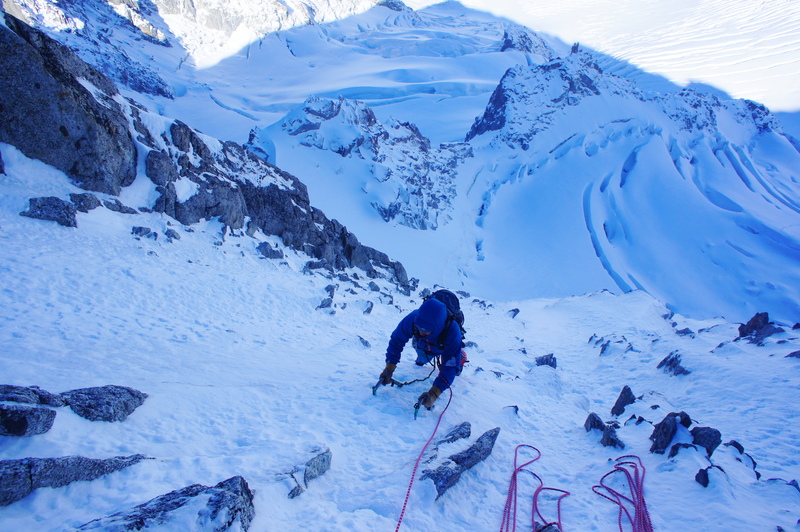 We salvaged the day swinging tools into the very crevasses that blocked our path, but were disappointed. It was such a crisp perfect window that was going to waste, the 4th of the week. I was annoyed at myself for not finding a way through given that Mark and Steph had rushed from work in Saas-Fee and hiked all the way up to the Albert Premiere refuge on my word that the Chardonnet was a goer. But such is life. There was only so many times I could have a leg punch through the snow and growl my heart back down from within the upper reaches of my throat. The Chardonnet monkey on my back started to cackle. Someone get rid of these packs! Mark and Steph en-awful-route down to Le Tour and back to work in Saas. Work finished a week later and I happily made the most of being able to go sport climbing at the new crags around Chamonix. 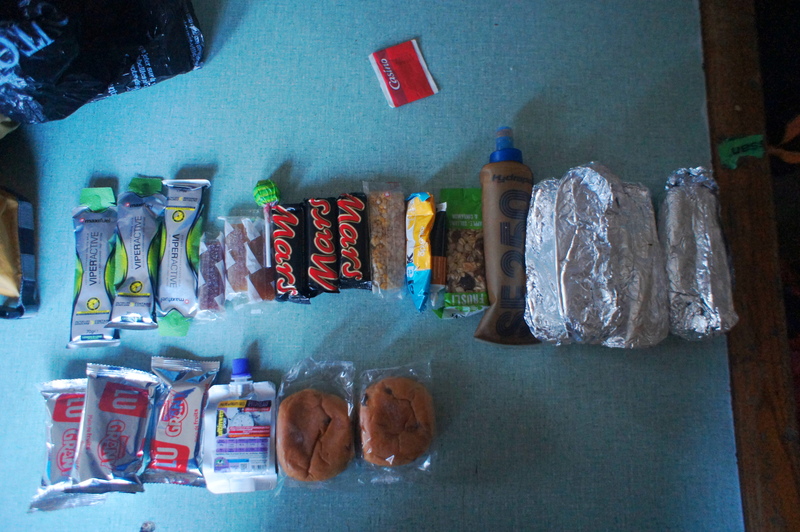 Then I made the mistake of going for a burger with Pete, and before I knew it the big bag was being packed once again to face the arduous slog back up to the Albert Prem! Pete kindly sorted out a heart-attack of a dinner for us both- 600gms tortelini with soup and single cream coupled with bread and butter leftovers found at the hut. Barely keeping it down we hit the hay. Well, Pete did. I spent the next 5hrs listening to various artists perform their late night slumber songs. Each pair of sleepers had a snorer- an unhealthy sounding, rattling, snorting snorer. Angry blood flooded my veins. The alarm came after what felt like a blink having seen 2:00am, and sounding at 3:50am. I tried not to let the door slam on my way out, I really did. This time taking the high route all the way past the turn off for Col du Tour we made good progress, even with 6-12 inches of fresh snow underfoot. Still, not out of the woods yet, Pete lead a careful path across snow bridges up to the bergschrund below the elusive North face. 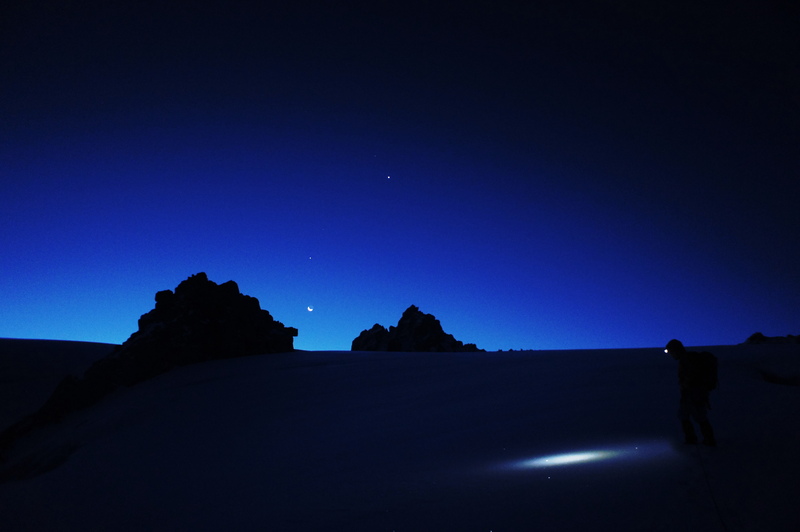 Moon rise on Le Tour Glacier. Pete breaking trail towards the Aiguille du Chardonnet. Once at the bergshrund we could see that the Aureille- Feutren gully was pouring with spindrift. Not keen to get quite that wintery just yet we decided to follow our nose up the gully systems to our right, knowing that there was a mix of routes in that general direction. In that very moment pure adventure was born! With no topo map I just started following logical lines that looked to be in the best condition. Senses and instinct whirring at their highest capacities. The route ended up being the first part of Debruyne-Manu and the second the Gabbarou 79. It was in excellent condition and made all the more interesting with the new snow. Textbook mixed climbing. Awkward bulges and short chimneys with lots of clearing to find the sparse protection available. The ice falls on the ’79 were particularly good quality. Leading up to the final ridge in deep snow with awkward rock steps/crawl through’s was exhausting at this stage of the day. 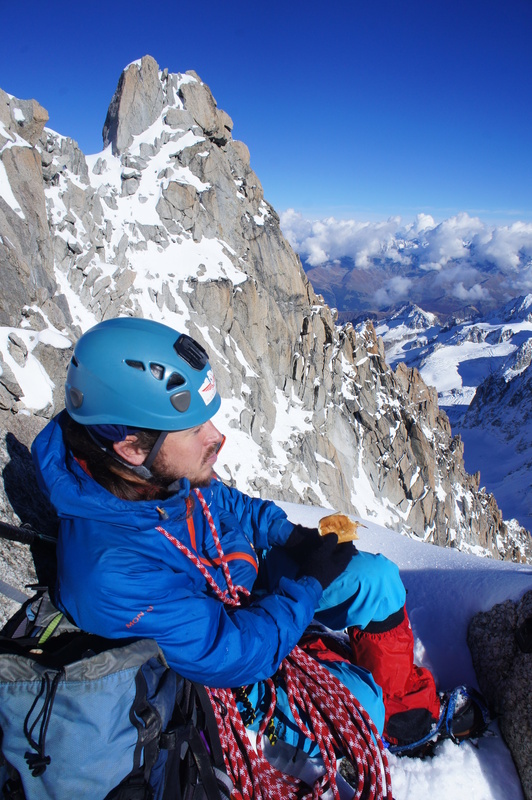 We took time on the summit to gnaw on the tartiflette baguettes (it’ll catch on I’m sure Pete!) before heading down the descent gully to the rap stations. Pete topping out just in time! Aiguille d’Argentiere and the argy basin. There are so many different anchors for different length ropes on the descent, it all got a bit confusing, and I found myself zooming past a couple of stations causing a fair bit of faffing. Once on the glacier, things got ‘interesting’. We knew breaking trail into the unknown would be the actual crux of the day. 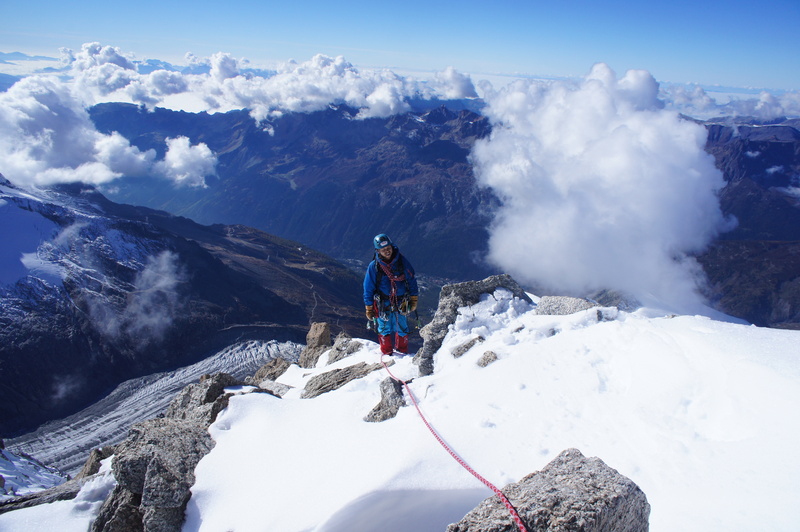 Previously when descending the Migot spur I had abseiled from V-threads over the bergschrund. Today there was too much semi-consolidated snow to build anything from- back to the rock on the right bank- a few lonely bits of tatt enabled us to lower past the first crevasse which turned out to be almost 10m vertical before plunging away(shudder). We hoped that from here we could hop over a col back to the glacier where we started, but arriving up there I found the slope a lot steeper than first thought, and again, perched on poor snow above the crevasses below- back to glacier l’Epaule we went. Picking our way through took concentration, logic, and luck. Crossing hidden bridges, following the strongest lines. We were close to being marooned when we finally found some ice to build a thread from. Relief washed over us once we were down like mapel syrup on a waffle stack. We trudged back to the hut, under a phenomenal milkyway. We sat. We drank coffee. We loaded up and hiked down to Le Tour. We went home. We slept in silent rooms on comfy beds. The monkey slumped off my back into the dark night. 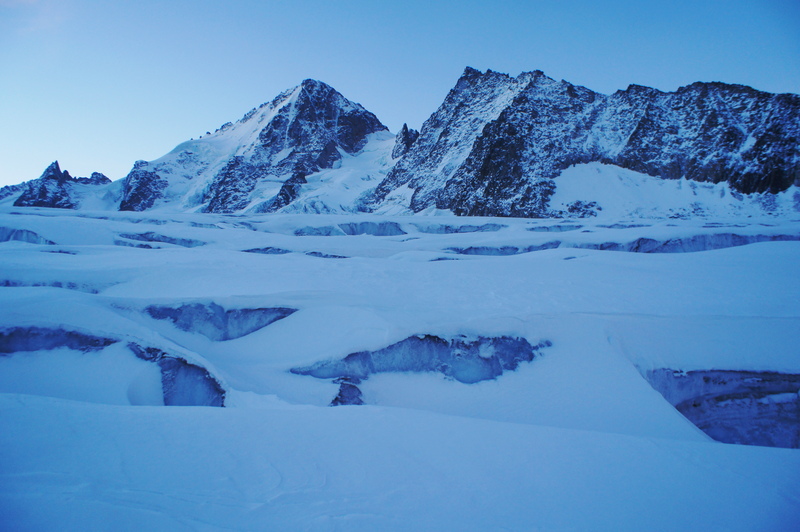 Timings: Le Tour to Albert Prem (2hrs 45)- hut to bergschrund (4hrs 30) – bergschrund to summit(6hrs)- summit to Le Tour glacier (4hrs)- Glacier to hut (2hrs 30)- hut to Le Tour (2hrs 15). Woke up at 4am. Got home at 1am. Phew! Equipment: x1 60m 8.6mm rope, 6 screws (2x 22cm, x3 16cm, 13cm), cams .75-2, nuts 1-8, x8 QD, x6 slings, personal crevasse rescue and climbing kits.